If you’ve noticed your computer running slow lately, you might be running low on hard drive or memory space. If you’re running Windows 10, there are some things you can do in Windows 10 to free hard drive space and increase computer speed. Remove Temporary Files – these are files that get saved on your computer as you use it. To get rid of them open settings < click system< click storage, under Storage Sense, you will see “free up space now.” Click that. The window that opens will give you options of what files you want to delete. These include – windows upgrade log files, system crashed windows error reporting files, windows defender antivirus, windows update cleanup, thumbnails, temporary files, recycle bin, temporary internet files, delivery optimization files, and previous windows installation. Check the boxes of all the ones you want to get rid of then click the Remove files button. Uninstall Apps and Games – most computers come loaded with apps and programs you will never use. If you’re looking for some more hard drive space, delete them! Open settings < click on apps < click on apps & features, select the apps you want to remove and click the uninstall button for each one. Follow the instructions and continue until all the unwanted programs are gone. Store Files in the Cloud – you can free up space by saving your files a cloud-based system. As a bonus, these files will be able to be accessed from anywhere. This makes it easier to recover if your computer crashes one day. You can use any of the big programs (Google Drive, Microsoft OneDrive, or Dropbox). Whichever one you decide, upload all your files to the service, and they will no longer be stored on your computer, freeing up space. 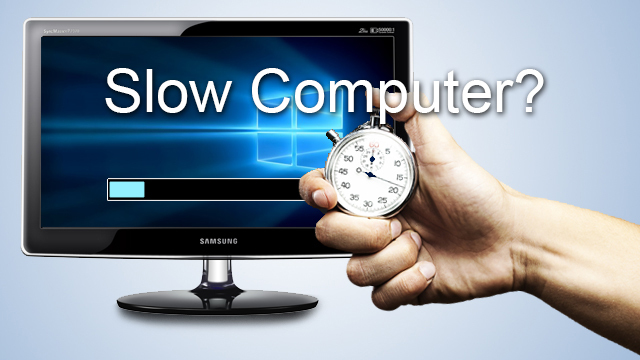 These four simple items can help speed up your computer. If you complete them and still notice that it is running slow, bring it into our shop. We can look at your computer and see if there is anything else that can be completed. Or, if you’re utilizing all your memory and need to add some or purchase a new computer.